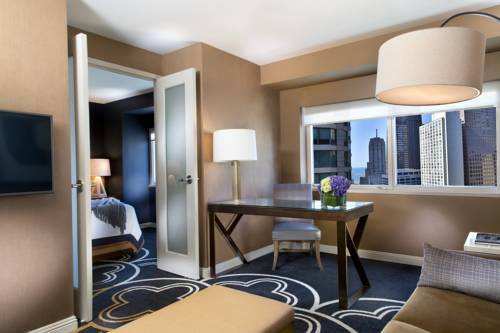 The Omni Chicago is the only ALL-SUITE luxury hotel on Michigan Avenue. Located in the heart of the Magnificent Mile it is surrounded by world-class shopping and entertainment as well as museums. Our 347 suites are some of the most lavish in Chicago. Enjoy the indoor swimming pool and health club or relax on the Sun Deck over looking Michigan Ave.
676 Restaurant: A delightful Contemporary American Bistro overlooking bustling Michigan Avenue. All food is sourced from local vendors whenever possible to ensure freshness and quality. The menu changes seasonally. Hours Sun-Thurs 0630-2200 Hours Fri-Sat 0630-0230. Hours Sun-Thurs 0630-2200 Hours Fri-Sat 0630-0230. The Omni Chicago is on the Magnificent Mile on North Michigan Avenue at the corner of Huron Street. It is in the heart of the shopping and dining districts as well as the entertainment district of the city. Only three blocks South of Watertower Place and the Hancock Tower. The hotel offers convenient access to downtown corporate offices as well as attractions such as the Art Institute of Chicago and Navy Pier as well as Shedd Aquarium and the Field Museum plus Soldier Field. The hotel is approximately 40 minutes from OHare Airport. American GirlLocated at the famous Water Tower Place. Features girls favorite shops and private dining as well as the exclusive Celebration Screen and so much more. Adler PlanetariumFirst Planetarium of America. Founded in 1930 by Chicago business leader Max Adler. The museum is home to three full-size theaters including the all-digital projection Definiti Space Theater and the Sky Theater as well as the Universe 3D Theater. BanderaTraditional American cuisine. Live jazz nightly. City CenterNo free shuttle from the property. No public transportation adjacent. City Center is within walking distance to the property.